Dockers InterchangeMichael Walters off due to an injury. Dockers InterchangeHayden Ballantyne off due to an injury. Power InterchangeAlipate Carlile off due to the blood rule. Welcome to Patersons Stadium for the Fremantle v Port Adelaide Round 22 clash. PORT Adelaide booked its spot in the finals despite suffering a 74-point defeat to Fremantle at Patersons Stadium on Saturday night. Dockers goalsneak Hayden Ballantyne and skipper Matthew Pavlich booted four goals apiece and Lachie Neale was outstanding in midfield as the home side cruised to a 21.8 (134) to 9.6 (60) victory. The loss was arguably Port Adelaide's worst effort of the year, but the Power had plenty of reasons to celebrate after the game as news filtered through that Essendon had upset Carlton in Saturday night's game at the MCG. That result guaranteed Port Adelaide would finish in the top eight, even if it loses to ninth-placed Blues at AAMI Stadium next Saturday. The finals berth under new coach Ken Hinkley caps a remarkable turnaround for the Power, who won just five games last year in a campaign that cost Matthew Primus his job. Port Adelaide had few winners on a dirty night but Matthew Lobbe held his own in the ruck against Zac Clarke and Jack Hannath, while Robbie Gray was busy with 28 touches and a goal. 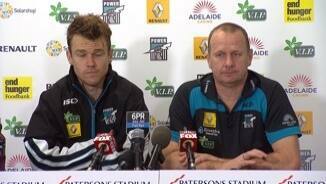 "As a footy club, we've qualified in our own right and that's a really pleasing thing for us," Hinkley said. "It would have been nice on the back of being able to play a bit better tonight, but that's not the case." Fremantle leapfrogged Sydney into third spot on the table following their fifth straight win. But the Dockers need the Brisbane Lions to upset Geelong at Simonds Stadium next week if they are to nab second spot. 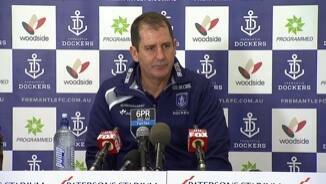 "Geelong are in red hot form and I think we acknowledge that," Ross Lyon said. "The odds are in their favour at home. It would take a really big turn-up with respect to Brisbane." Fremantle defender Nick Suban is in danger of missing the start of the finals after injuring his right hamstring in the opening term. "He's got a tight hamstring, needs to be assessed," Lyon said. Ballantyne entered the match under his own injury cloud after damaging his right shoulder against Melbourne the week before. 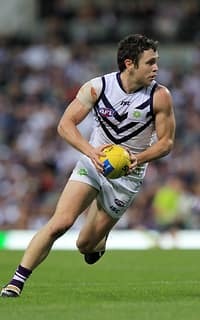 The 26-year-old didn't appear bothered in the opening half, booting three goals and causing all sorts of problems at ground level as the Dockers opened up a match-winning 55-point lead. But it wasn't all smooth sailing for the little maestro, who sent a scare through the Dockers' camp in the third quarter when he grabbed his shoulder in pain after being tackled hard to the ground. Ballantyne immediately went off for treatment, but he was given the green light to resume and kicked his fourth goal shortly after. Michael Walters and Ballantyne combined for the first four goals of the match as the Dockers' frenzied pressure took its toll on the Power. Ballantyne's pressure at ground level was simply brilliant, with Power defenders often forced to rush their disposal as the Dockers goalsneak closed them down. Fremantle slammed through five unanswered goals during the second term, but Ballantyne's third major was a highly controversial one. Ballantyne should have had little trouble as he ran onto a loose ball in the goal square after Walters punched it into his path. But a wicked bounce saw the ball appear to evade Ballantyne's swinging boot, with the Docker hanging his head in apparent disappointment as the ball dribbled over the goal line. However, the goal umpire awarded the goal without going to a review after deeming Ballantyne had made contact.